Please explain in layman’s terms, the results of your study, especially regarding the impact of climate change on sarus cranes’ reproductive cycles? Sarus Cranes time their breeding very closely with rainfall. They wait until water fills up on the landscape, then make large nests out of aquatic vegetation on the water. In areas where natural waterbodies are too deep, or have been converted by humans, many Sarus Crane pairs nest inside rice fields. Where farmers are tolerant of such intrusions, these cranes can breed even when their natural habitats have declined. So, the primary or main breeding season of Sarus Cranes is the monsoon when north India gets its rains. However, it was known that Sarus can sometimes make nests outside of the monsoon. This we call unseasonal nesting since it is outside of the primary nesting season. This behaviourwas not very well understood. Did some crane pairs breed more than once in an year? What kind of environment allowed crane pairs to breed outside of the monsoon? How many crane pairs nest unseasonally? These questions had not been answered. With my colleagues Mohammad Yaseen from Chittorgarh and Kandarp Kathju from Ahmedabad, I assembled all of the breeding records we had for Sarus Cranes from several states going back to 2004. The three of us have been working on this species since the late 1990s, and decided that combining forces will allow us a deep insight into Sarus’ unseasonal nesting. We were able to pull out over 5,000 instances of breeding – the largest data set ever assembled for this species! We noticed a couple of things immediately. 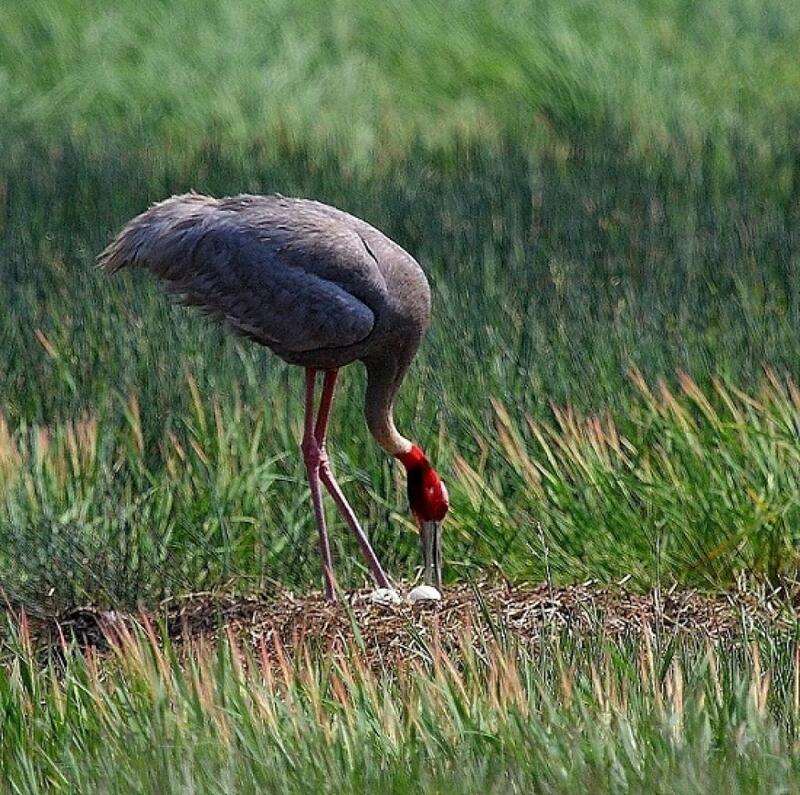 Unseasonal nesting was quite rare for the Sarus Cranes. Despite several years of work in lowland Nepal, we did not get even one such record. In fact, less than 0.3% of all our records were unseasonal nesting. This was, in and of itself, a sound finding since previously we had no idea of how common this behaviour was. We also saw that all of the unseasonal nesting were related to irregular water supply in the cranes’ territories. This supply was either from rainfall that occurred outside of the regular monsoon season, or was from irrigation canals that artificially kept the landscape wet. A few pairs tried to breed unseasonally in years when rainfall was far below normal disallowing them to breed in the primary nesting season. With the changing rainfall regimes in India, alongside the associated changes in water supply for agriculture, the Sarus appeared to be altering its behaviour. Is it just climate change that is having an impact on the sarus crane or is it climate change coupled with land use and change in cropping patterns? Please elaborate. Sarus Cranes are most commonly found in areas that have monsoonal rice fields. These fields lead to vast areas being flooded in one season and resemble wetlands themselves. Along with rice fields, Sarus also need farmers that don’t mind them breeding in the fields. In drier areas like Rajasthan, Sarus breeding is almost-entirely restricted to wetlands – either natural or artificial reservoirs. 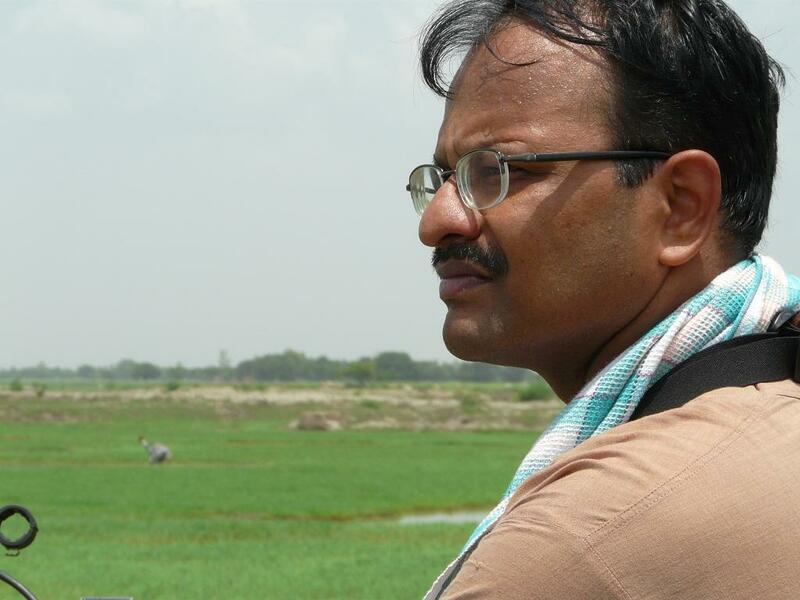 Yaseen has been tracking Sarus breeding in Chittorgarh, for example, where rice is rare and corn is the dominant monsoonal crop. In areas where rice or corn was replaced by drier crops such as soybean, Sarus Cranes are very rare. Clearly, the Sarus are adapting as best as they can to the changing landscape as determined by the Indian farmer. The biggest risk today therefore is not just altering rainfall regimes, but the risk of farmers changing their crops from rice to drier crops. Is climate change and/or change in land-use pattern also having an impact on the ranges of these birds? Over a period of 250 years, the distribution range of Sarus Cranes in south Asia has reduced. The reasons behind the reduction are not very well understood, but there are several clues. It may be that increasing the intensity of cropping – either via increasing machined farming like in Punjab, or reducing the time of growth of rice as in peninsular India – is a major culprit. Large waterbirds like Sarus Cranes appear not to like areas with mechanical farming. They also need the crops during their primary breeding season to have a 3-4 month growth period. This allows the chicks to hide in tall vegetation and survive until they can start to fly, and can avoid predators. When governments decide to reduce the wetness of an area by encouraging dry crops, birds like the Sarus suffer. Such decisions are of course not taken independently, but can be related to changing rainfall patterns such as increased drying. Alternatively, when governments facilitate wet crops via irrigation canals or new reservoirs, like they are doing now in large areas of Rajasthan and Gujarat, Sarus Crane benefit. So the life of the Sarus in India is almost as complex as our patterned agricultural history, which in turn is tied strongly to climatic conditions. What is the current status of the science of studying the impact of climate change on wildlife, in Indian and globally? Will we able to see the true impact only in the long-term since data is itself being currently churned out? Climate science is an exceedingly mature science, but in India is focused largely on the monsoon, which is the lifeline of our farming. Long-term and large-scale efforts to understand its impacts on wildlife are very rare. The absence of systematic long-term studies on species habits will disallow us from knowing closely how wildlife is impacted from these changes. Citizen science efforts to track wildlife in India are growing, and can provide some information with which to study climate change impacts on wildlife. There is a real need to establish long-term studies on wild species in India in a range of conditions so we can use these species as indicators of how our world is being impacted by climate. What can be done to increase sarus crane numbers in India, especially vis-à-vis crop and land-use patterns? Unlike most other species, the Sarus Cranes live on massively human altered landscapes. The majority of the global population lives in India, and lives on agricultural areas, in artificial reservoirs, and in community-managed wetlands that are not protected reserves for wildlife. Our way of thinking to manage a species like this therefore cannot be the same as we do for a species that lives primarily in protected wildlife sanctuaries. The biggest favour we can do to Sarus Cranes is to reduce chemical inputs, especially pesticides that result in the deaths of tens of Sarus each year. This can be achieved only if we look more carefully at croplands. We need to look at them as not merely areas that produce food for humans, but as more complex and amazing systems that are capable of providing multiple benefits. These benefits will of course continue to be food production, but ensuring that some traditional practices such as retaining community-used wetlands amidst fields, is key. Current policies on agriculture are not holistic since there is poor recognition of Indian farms also being a home to a surprisingly large number of bird species. As part of my programme, which is a collaboration between the International Crane Foundation and the Nature Conservation Foundation, we are attempting to uncover how this unlikely coexistence is possible. We are interested to learn how to strengthen this coexistence paying attention to local conditions where farmer attitudes appear to be a very important facet of the relationships. We want to figure out how to help continue and spread this positive attitude, and want to avoid corrupting a working system with conventional conservation ideas such as payments or protectionism. This is a long-term effort and we do not know yet whether we will find sound ways to continue having Sarus Cranes share farmlands with our farmers. But we have a great head-start since farmers in many locations live in a way that allows incredible diversity to live alongside them.